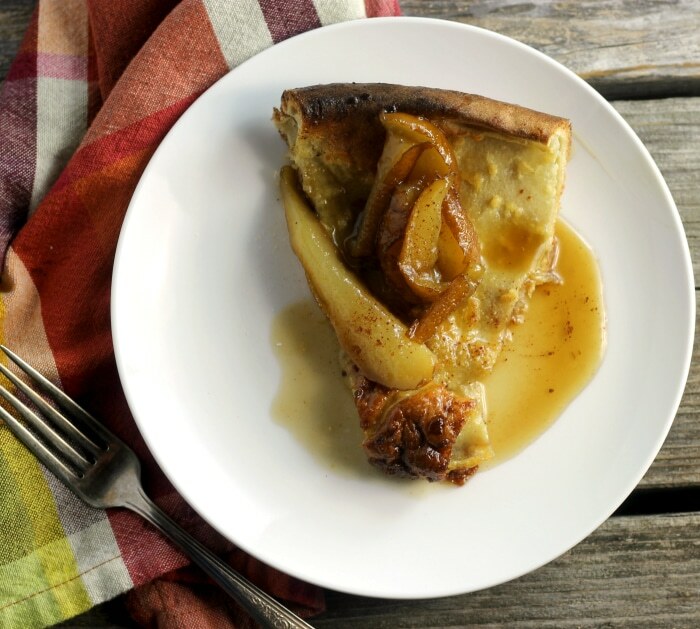 Dutch baby pancakes with caramelized pears are not your everyday pancakes. They are light, puffy, and over all delicious. I have had Dutch baby pancakes on my list of things to make for a very long time. It was shortly after I started my blog when I saw a post on another blog site for these pancakes. It really sparked my interested. Even though it has been a few years since I first saw them I have never made them. The reason for not making them before this is because I did not have an oven proof skillet, which is needed for these Dutch baby pancakes. A few weeks ago I broke down and bought a cast iron skillet. Yes, and I finally made them. I will say this they were worth the wait. 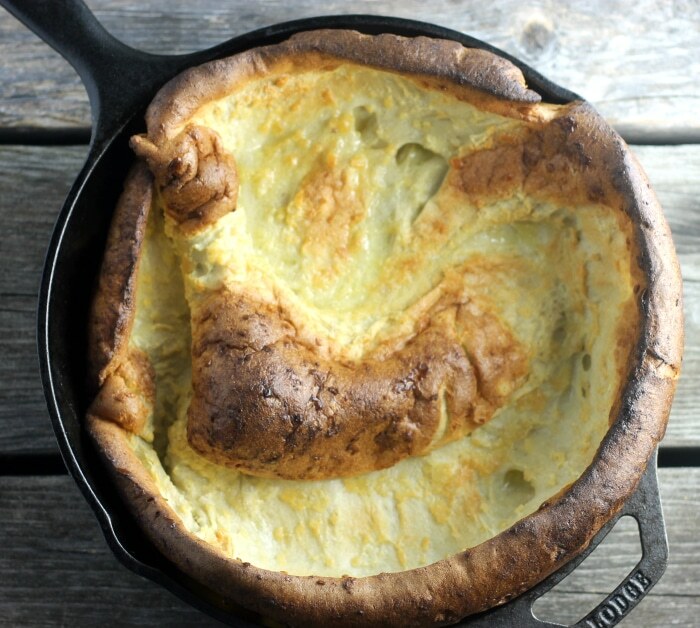 This Dutch baby pancake is super easy to make and only takes a few ingredients. Plus the ingredients that you need I bet are in your refrigerator or your pantry. I dressed mine up with some caramelized pears which made them extra delicious. No matter what recipe you look at they are all basically the same recipe. I chose a recipe that I found on the web from the New York Times cooking page, you can find it here. Most recipes that I looked at said to use a blender, but the one I followed said that you mix by hand. I decided to mix it by hand which worked fine. You know fewer dishes to clean up. This recipe is not something that you would consider for during the week, since they do take time, but they are perfect for a Sunday brunch. Or if you are looking for something for Mother’s Day, this would be perfect. Add the egg mixture to the dry ingredients and whisk together until the batter is smooth. The batter should be thin and free of any lumps of flour. Add the butter to the skillet and heat in the preheated oven. Make sure to watch carefully so that the butter does not burn. Once the butter is melted remove the skillet from the oven and pour in the batter. Return to the oven and bake for 15 to 20 minutes or until the pancake is golden brown. Reduce temperature to 300 and continue to bake for 5 more minutes. While the pancake is in the oven make the caramelized pears. Cut the pears into thin slices. Serve the pancake right away. 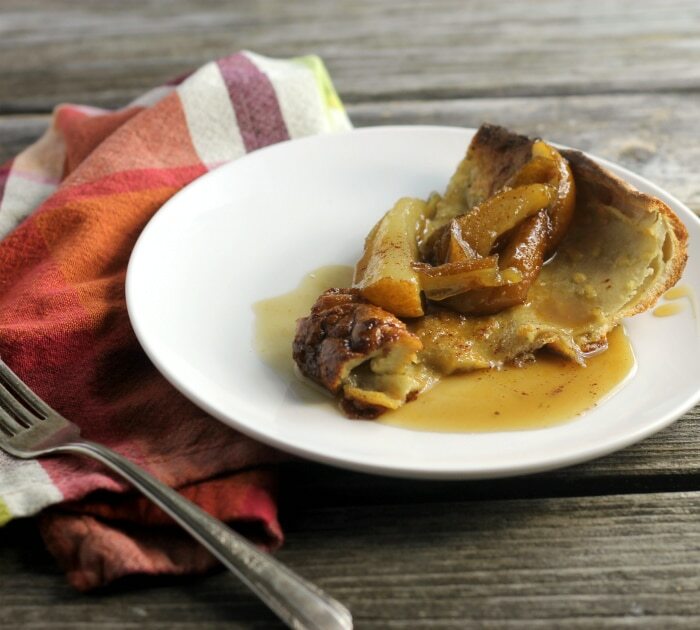 Top with the caramelized pears. Sprinkle with cinnamon and sugar if desired. I’ve never seen these. Pretty cool. 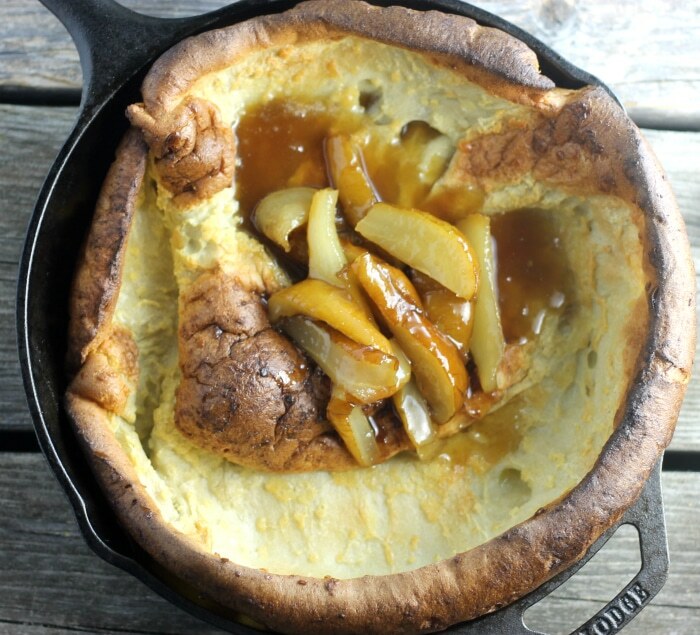 wow I love that you served that perfect dutch baby with caramelized pears…looks utterly delicious! I made a dutch baby a few weeks ago with berries, but now I’m craving one with pears! So yummy! I totally have had Dutch baby pancakes on my short list for a looong time now, too! I love using my cast iron skillets, though, so maybe I finally need to make this one. The caramelized pears are such a fun addition, too! Yum! look absolutely delicious Dawn !